Why is she leaving a position of such influence? Others are suggesting that her role has become limited since John Bolton took over as national security adviser. Critics have questioned her use of private airplanes last year. And some wonder if financial considerations were a factor since she has one child in college and another headed there soon. 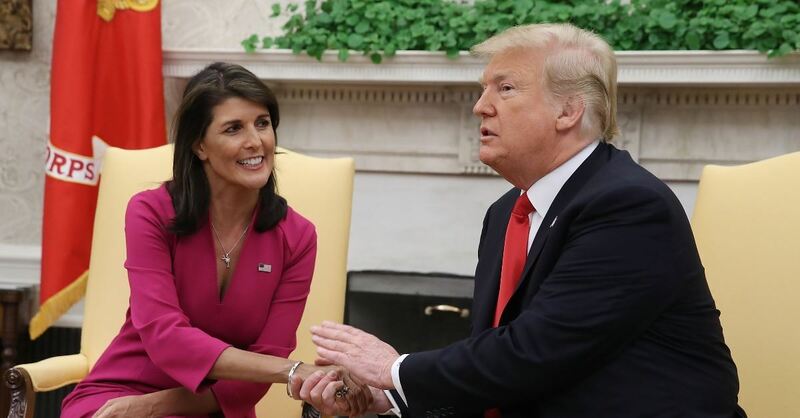 It’s worth noting that her two-year tenure is exactly the average for a UN ambassador: Since the position was created in 1946, there have been thirty-six people to hold the office. In other news, Hurricane Michael is expected to make landfall over the Florida Panhandle later today. Forecasters predict “a dangerous storm surge, flooding rainfall and damaging winds.” Total damage and economic impact in the US could approach $15 billion. In this day of heightened political tensions, we should not be surprised that the approaching storm is sparking political storms as well. Florida Gov. Rick Scott, who is running for the US Senate, may see his favorability ratings rise as he responds to the natural disaster. Skeptics are already claiming that his hands-on response to the pending tragedy is politically motivated. In addition, the Democratic nominee for governor pulled his TV spots from media markets set to be impacted by the storm, while his Republican opponent did not. Now both sides are accusing the other of using the storm for political purposes. Why are we so quick to ascribe political motives to political leaders? One reason is that we’re so often right when we do. Time will tell if Ambassador Haley has other reasons for resigning her post. I sincerely hope that, as a professing Christian, her actions mirror her explanations. And I sincerely hope that mine do as well. Paul could testify: “We behaved in the world with simplicity and godly sincerity, not by earthly wisdom but by the grace of God” (2 Corinthians 1:12). Peter cautioned us to “put away all malice and all deceit and hypocrisy and envy and all slander” (1 Peter 2:1). One of the primary reasons for Billy Graham’s remarkable effectiveness was his personal integrity and sincerity. When I think of Christians whose lives have most influenced mine, their character comes first to mind. The jaded nature of our culture has a silver lining: the more skeptical our society, the more persuasive our commitment to integrity. Presidential historian Doris Kearns Goodwin’s latest book, Leadership: In Turbulent Times, is a captivating look into the private lives of Abraham Lincoln, Theodore Roosevelt, Franklin D. Roosevelt, and Lyndon Johnson. She opens a fascinating window into the way in which attacks on Lincoln’s personal integrity came to shape his character and future. When Lincoln served the Illinois state legislature, a deep economic recession prevented him from keeping promises he’d made to rebuild state infrastructure. His reputation was left in tatters. He also broke off his engagement with Mary Todd, causing her deep embarrassment and inciting much social animosity toward him. Lincoln fell into a deep depression. But rather than wallow in despondency, he resolved to rebuild his reputation. He redoubled his efforts to become an excellent lawyer and rekindled his relationship with Mary Todd, leading to their marriage. He began campaigning effectively for other candidates and perfected a speaking style that helped immortalize him as president. One way God redeems the skepticism of our day is by using it to distinguish those who choose to live with integrity. But it’s not enough for us to act with character–what we do must match who we are. And we cannot change who we are unless we remember Whose we are. The psalmist could “give thanks to the Lord with my whole heart,” not just his public worship (Psalm 111:1). Paul was “crucified with Christ” so that “it is no longer I who live, but Christ who lives in me” (Galatians 2:20). Before we can live with character, we must live for Christ. We will manifest the nature of Jesus to the degree that we are yielded to the lordship of Jesus.